The Mission of the St. John Cantius chapter of St. Paul Street Evangelization is to respond to the mandate of Jesus to preach the Gospel by taking the Catholic Faith to the streets of Chicago. We recognize that Christ’s call to evangelize was made to every Catholic Christian, and the Second Vatican Council reiterated this need, urging each of the baptized to bring the Gospel, found fully in the Catholic Church, to a culture that has largely reverted to paganism. Further, we believe that the particular charism of St. John Cantius, with its emphasis on experiencing God in the transcendent beauty of sacred liturgy, art, architecture, and music, will inspire those whom we invite into our parish to draw ever closer to the heart of Jesus. Do you want to share your love of Jesus Christ and His Church with others? Are you ready to step outside your comfort zone? Do You have a heart for the lost and downtrodden in Chicago? Do you want a practical way to share your faith? Do you want others to experience the beauty of St. John Cantius Church? 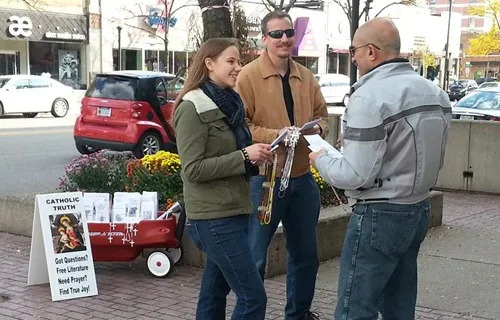 The St. John Cantius chapter of St. Paul Street Evangelization is seeking interested parishioners who would like to share their faith on the streets of Chicago witnessing to the beauty and richness of Catholic truth in a loving, non-confrontational manner. We will offer free rosaries, prayer cards, medals, CDs, and invite people to consider the Catholic Church. We will pray for people, and plant seeds so that the Holy Spirit can convert hearts. Come with us as we take to the streets of Chicago, praying for those in need, explaining the Catholic faith to others, and witnessing to what Christ has done for you in your life. Street Evangelism not for you? Sign up for our email list where we will provide you with updates from the streets. We will distribute prayer requests from those we meet and interact with in our Evangelistic outreach.